The Check Engine Light (which is actually the Malfunction Indicator Lamp or MIL) alerts you when an emissions-related problem occurs with the engine control system or emission controls on your vehicle. Depending on the nature of the problem, the Check Engine Light may come on and remain on continuously or flash. Some intermittent problems will make the Check Engine Light come on only while the fault is occurring (such as engine misfire). The Check Engine light usually remains on once a fault has been detected, and will remain on to remind you that a problem has occurred that needs to be investigated. An illuminated Check Engine Light can be annoying because you don't know what's wrong, and whether or not the problem might be a serious one or just a minor fault. There is no way to know what the problem is until you plug a scan tool into the vehicle's diagnostic connector and read out the code(s) that turned the light on. If no other warning lights are on, and the engine seems to be running normally (no unusual noises, smells, vibrations, etc. ), you can assume the fault that is causing the Check Engine Light to come on is probably minor and won't hinder your ability to continue driving. But if other warning lights are on, you should probably stop and investigate the problem. When the Check Engine Light comes on, a diagnostic trouble code (DTC) is recorded in the powertrain control module (PCM) memory that corresponds to the fault. Some problems can generate more than one trouble code, and some vehicles may have multiple problems that set multiple trouble codes. In most older vehicles (those made before 1996), disconnecting the computer's power source or disconnecting a battery cable erases fault codes and turns off the Check Engine Light, at least temporarily. If the problem persists, the code will reset and the Check Engine Light will come back on. But on many newer vehicles, you do NOT want to disconnect the battery because doing so can wipe out the computer's memory settings. This may affect the operation of the transmission, climate control system, and other functions. 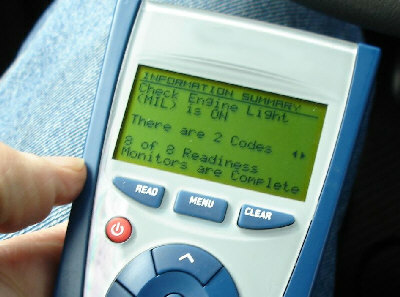 In 1996 and newer vehicles, a scan tool or code reader must be used to erase codes and turn the Check Engine Light off. If your Check Engine light is on, you need to read the code(s) that are causing it to come on with a code reader or scan tool. Plug the tool into the 16-pin OBD diagnostic connector (usually located under the dash near the steering column). When the ignition is turned on (don't start the engine yet), the tool will communicate with the PCM. You may be asked to enter the year/make/model and VIN code of your vehicle if the scan tool does not automatically recognize the application. Choose the READ FAULT CODE option on the scan tool menu, or press the button that allows the tool to read the codes. The tool will then display a number and/or code description that corresponds to a particular fault code. The letter "P" is the designation for Powertrain codes (which includes all of the engine controls, related emission controls, catalytic converter and fuel tank vapor control system). If there are more than one code, the codes will be listed in numeric order. TIP: Write the code(s) down on a piece of paper before you erase them. You may need to refer to the codes again later if the same problem keeps returning. Erasing the codes will turn the Check Engine Light off, but sooner or later the codes will likely return and turn the Check Engine Light back on again if the problem is still there. Important! A fault code will tell you which sensor or system experienced some kind of problem. But the code will NOT tell you why the fault occurred, how bad the fault is or which part to replace. That usually requires more advanced diagnostics. Prior to OBD II, fault detection was mostly limited to "gross failures" within individual circuits or sensors. The first generation systems were not capable of detecting misfire, converter problems or fuel vapor leaks. OBD II changed all of that by adding the ability to monitor these things so emission problems can be detected as they develop. OBD II uses the Check Engine Light to alert the driver when a fault occurs, and it stores trouble codes that correspond to specific kinds of problems. It can also track problems as they develop and even capture a snapshot of sensor data when a problem occurs. Almost any emission problem that causes hydrocarbon emissions to exceed 1.5 times the federal limit can cause the Check Engine Light to come on with OBD II, even if there is no noticeable driveability problem accompanying the emission problem. OBD II not only monitors the operation of all the engine's sensors and systems (fuel, ignition, EGR, evaporative emissions, etc. ), it also monitors the operation of the catalytic converter and can even detect engine misfires! Anything that could possibly affect emissions is monitored by OBD II, including a loose gas cap! A misfire will cause the Check Engine Light to flash while the misfire is occurring. A misfire that occurs in a given cylinder will also set a P030X code where "X" will be the number of the cylinder that is misfiring. For example, a P0302 code would tell you cylinder number two is misfiring. Remember, the code does not tell you why the cylinder is misfiring. You have to figure that out by performing other diagnostic tests. The misfire might be due to a fouled spark plug, a bad plug wire, a defective ignition coil in a DIS ignition system, a clogged or dead fuel injector or a loss of compression due to a leaky exhaust valve, leaky head gasket or worn cam lobe. OBD II monitors the operating efficiency of the catalytic converter with a second oxygen sensor in the tailpipe behind the converter. By comparing upstream and downstream O2 sensor readings, it can determine how well the converter is doing its job. If converter efficiency drops below a certain threshold, OBD II will set a code and turn on the Check Engine Light. OBD II can detect fuel vapor leaks (evaporative emissions) in the charcoal canister, evap plumbing or fuel tank by pressurizing or pulling a vacuum on the fuel system. If the gas cap is loose or missing, it will detect it, set a code and turn on the Check Engine Light. In addition, OBD II can also generate codes for various electronic transmission problems and even air condition failures such as a compressor failure. OBD II is capable of generating two types of diagnostic trouble codes: "Generic" or "Global" codes (P0) that are the same for all makes and models of vehicles (these are required by law), and "Enhanced" or "OEM" codes (P1) that are unique to specific vehicles. Enhanced codes can also cover non-emission related failures that occur outside the engine control system. These include ABS codes, HVAC codes, airbag codes and other body and electrical codes. The "generic" codes that are common to all vehicle manufacturers can be accessed using any basic code reader or scan tool that is OBD II compliant. Unfortunately, most older scan tools made before 1995 won't work on 1996 and newer vehicles with OBD II. You need a scan tool that has the proper hardware and software to talk to your onboard computer so it can read OBD II codes and other diagnostic information. In fact, a scan tool or code reader is required to read codes on most 1996 and newer vehicles because most newer vehicles do not have manual flash codes. There are some exceptions. Some Nissan models still provide manual flash codes, as do some Dodge models. Most GM, Ford, Honda and Toyota models do not have flash codes, but on some GM vehicles with a driver information display, there may be a procedure for displaying codes manually. A simple code reader that plugs into the vehicle diagnostic connector can usually be purchased at an auto parts store for under $60. A basic scan tool that can read codes and additional system data (and erase codes) may sell for $70 to $400 depending on its features. The kind of scan tools that professional technicians use can cost several thousand dollars and have more advanced features, including bidirectional capabilities that allow the scan tool to run various self-tests that are built into the engine management system on your vehicle. These types of advanced tests may be required for more difficult-to-diagnose problems. The high end professional level scan tools can also graph sensor voltages, allowing them to reveal diagnostic data that a simple DIY scan tool cannot. If you do not have a code reader or scan tool, you will have to take your vehicle to a repair facility or auto parts store if you need to diagnose a Check Engine Light problem. Money Saving Tip: Some parts stores (such as AutoZone and others) will do a FREE plug-in diagnosis for you, or they will loan you a scan tool so you can do the basic diagnosis yourself in the parking lot. The scan tool will tell you what the codes are that turned on your Check Engine Light. Just remember that a code by itself does NOT tell you which part may need to be replaced. Additional diagnostic tests are usually needed to determine the underlying cause that set the code. For example, a P0300 Random Misfire Code means the engine is misfiring in multiple cylinders but it doesn't tell you why it is misfiring. The cause could be fuel, ignition or compression, or any combination thereof. Additional tests are needed to identify the cause of the misfire. If your Check Engine Light is on, your vehicle will NOT pass an OBD plug-in emissions test. So if you are required to take such a test, the light must be out and there must be no codes in the PCM memory. You can't just erase the codes, drive your vehicle to the test station and take the test if the original problem is still there. The OBD II monitors need time to set, which usually requires driving at various speeds, sometimes over a period of several days. The OBD plug-in test checks to see if all of the monitor self-tests have completed, and if they have not your vehicle is rejected for not being ready. The OBD plug-in test also determines if your Check Engine light is functioning properly. if the lamp is burned out or has been disabled, your vehicle will be rejected until the bulb is replaced or the problem has been fixed. If the test finds any DTCs (Diagnostic Trouble Codes), your vehicle will fail the emissions test. The test center should give you a print out that lists any codes found along with possible suggestions as to what may be causing the fault(s). You must then have your vehicle repaired (which you can do yourself if you have the tools and know-how to do) or you can take it to a repair shop or new car dealer to have the problem fixed.